Online advertising is something that almost any business, including small local ones, can profit from. Unlike traditional forms of advertising, Internet marketing is relatively risk-free due to the fact that many of the methods don’t have to cost you anything. Compared to things like television, radio and magazine advertising, marketing your business on the Web allows it to reach the widest audience possible. With hundreds of millions of people using their mobile phones to check their social media profiles and emails on a daily basis, you are able to reach your targeted audience around the clock, independently of time zones. 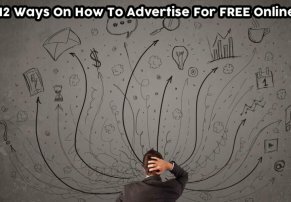 The following takes a look at ten of the most efficient and completely free methods of advertising online. With around one-billion users worldwide and growing, Facebook presents a world of opportunity to anyone looking to market their business online. It costs absolutely nothing to create a Facebook page for your business, and while the world’s favorite social network also offers a paid advertising option, you can still achieve plenty without parting with any money. Your business’s Facebook page provides you with an outlet to provide news updates, build customer relations and showcase your business. With around half a billion users, Twitter is another of the world’s most popular social media sites. While Twitter is far more limited than Facebook, it is simplicity that makes it popular. The micro-blogging service is also completely free to use. You can post short updates, known as ‘tweets, ’ up to a length of 140 characters. This limitation is due to the fact that it is designed to be compatible with SMS services as well. Twitter is exceptionally easy to use, and it provides you with another effective way to reach out to customers and build up a community. Content is the indisputable king of the modern Internet. That is to say, content which is original, high quality and provides value to your readers. Blogging provides you with a great platform to provide your customers and potential customers with interesting news items and other content which they may find useful. The search engines also love frequently updated material, so blogging has become a must for many businesses. Assuming you already have a business website, you won’t need to pay any more to connect a blog to your website. With the rise of the social media giants, Internet forums are not as popular as they once were. Nonetheless, if you can find one or more highly active forums which are used for discussing matters related to your niche, it is worth joining them. Just like many social networks, forums are online communities which you can use to make yourself known among your targeted audience. Use them to interact with others, provide advice, answer questions and give something to the community. Forums aren’t for advertising per se, but they are useful for building trust and rapport. Due to the fact that most people now connect with their friends over social networks, email marketing might not hold the weight it once did, but that certainly doesn’t mean that you should ignore it. Email marketing remains one of the most effective Internet marketing options, and while there are paid programs aimed more towards larger businesses with huge emailing lists, you don’t necessarily have to pay a thing. Try offering an email newsletter to your customers, but don’t send unsolicited mail, as this may end up being counterproductive.